Classic Nord design meets the acoustic grand piano. The Nord Grand is what Nord fans have been waiting for. The first stage piano from Nord with triple sensors. The Grand delivers a truly authentic and natural feeling acoustic grand piano. 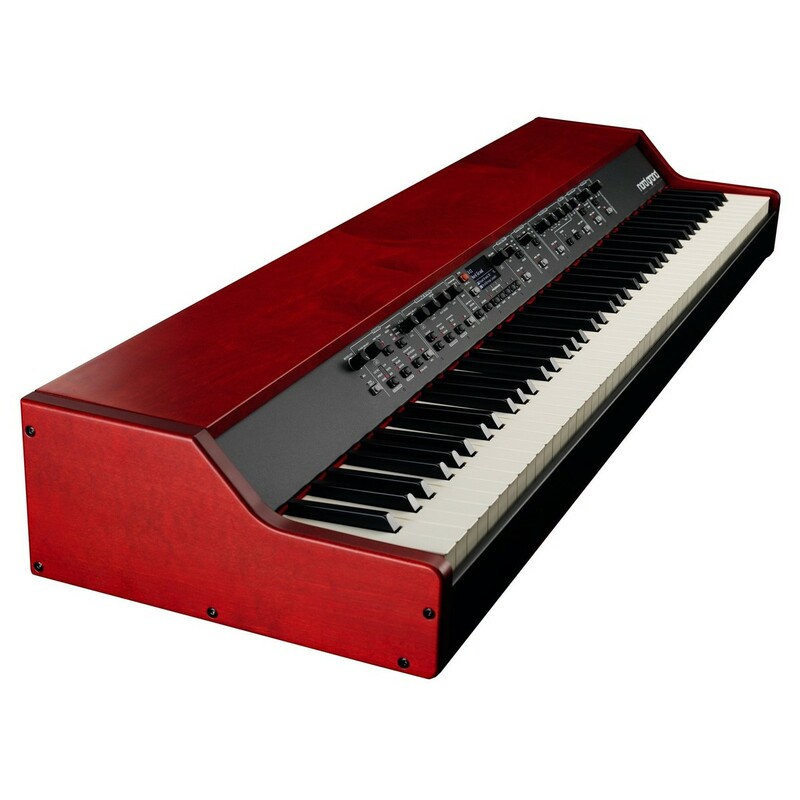 The Nord Grand features a highly responsive Kawai hammer keybed, complete with triple sensor keybed technology. This delivers exceptional articulation and extraordinary control for any playing style. It incorporates award-winning performance features with an intuitive interface, delivering a truly beautiful sound that is normally reserved for high-end grand pianos. As with any other Nord stage piano, the Grand features a piano, sample synth and effects section complete with a wide range of voices. Utilise everything from creative piano filters to premium-grade string, brass and choir sounds from the Nord sample library 3.0. Experience the most authentic grand stage piano on the market today. Extreme precision and a natural feel. The Grand is the first stage piano from Nord that features triple sensors which follow the movement of the built-in hammers. This ensures exceptional accuracy, delivering the smooth and natural feel of an acoustic grand piano. 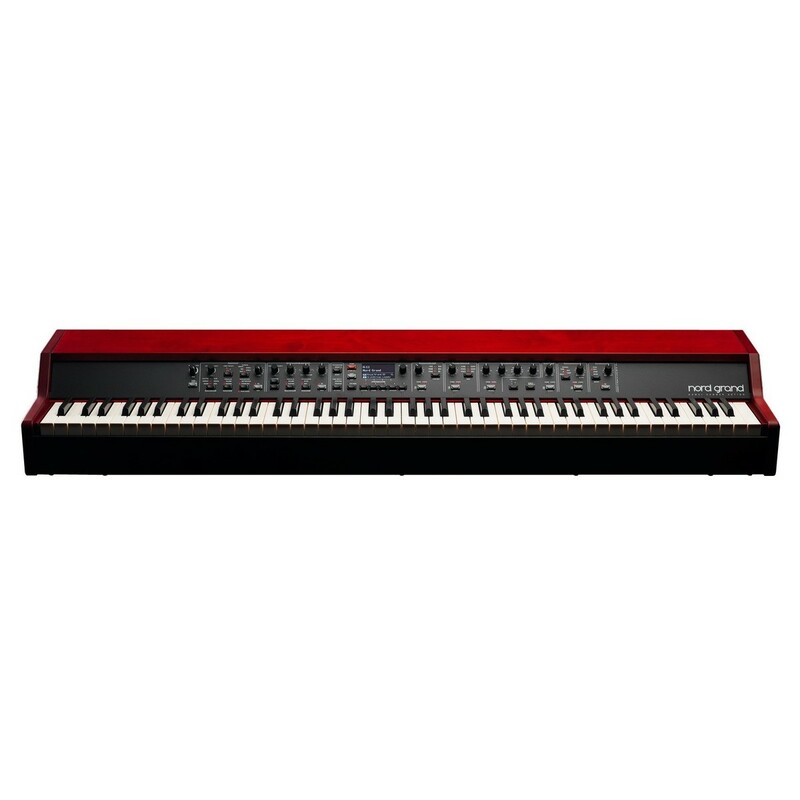 Nord have incorporated a wide range of award-winning features, including the highly intuitive interface that sits at the centre of the stage piano. The highly responsive triple sensor keybed possesses an advanced mechanism, providing unparalleled control when playing in virtually any style. Play percussively or pianissimo with fluent repetitions. The custom Ivory Touch surface provides an authentic feel when playing, optimised to feel like a grand pianos keybed. At the heart of the Nord Grand is the piano section. This section provides you with a wide variety of beautiful-sounding piano sounds. 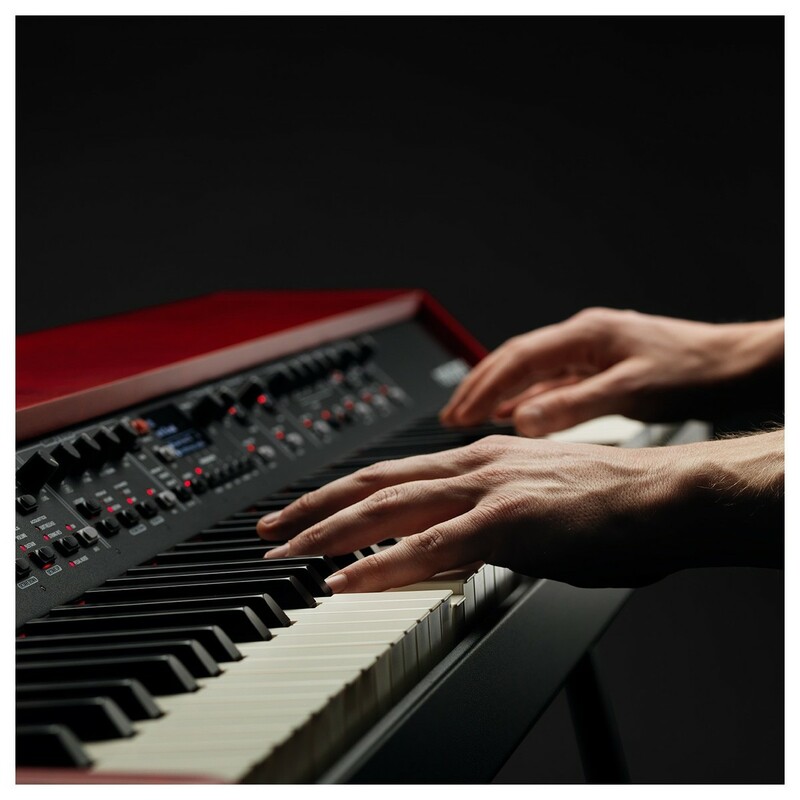 From Grand to Upright, Electric and Digital pianos, the Grand provides you with all the sounds you’ll ever need. 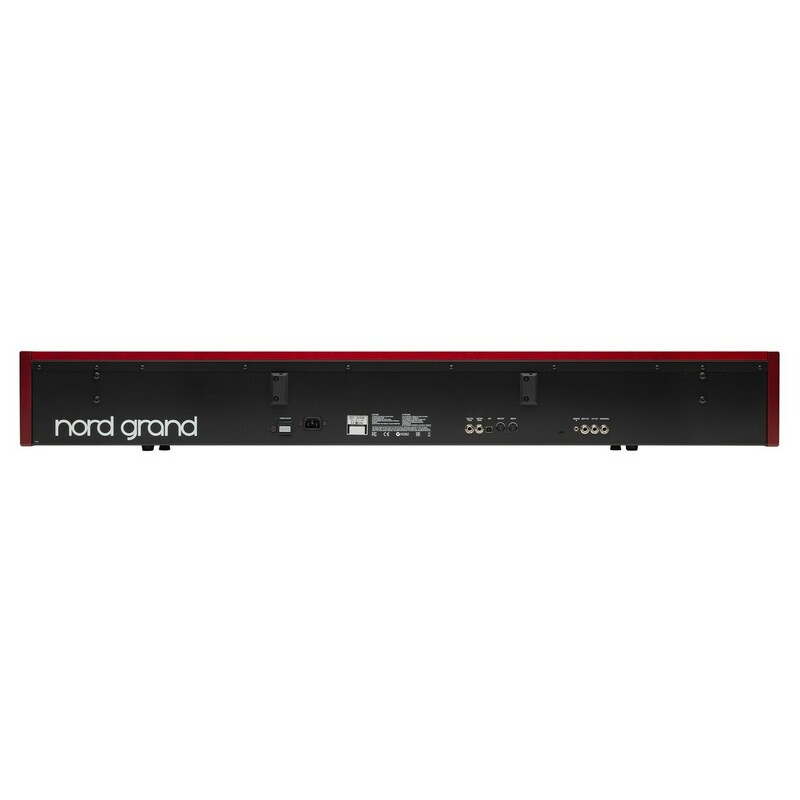 The Nord Grand factory banks is comprised of 10 Grands, 9 Uprights, 10 Enhanced Electric Pianos, Clavinet, Digital Pianos and more. These hand-picked sounds have been incorporated for their unique character and unparalleled authenticity. They react and feel like the real thing, capturing every nuance of its character; thanks to Nord’s cutting-edge sampling techniques. 120 voice polyphony, allows you to create rich and full-bodied sounds. 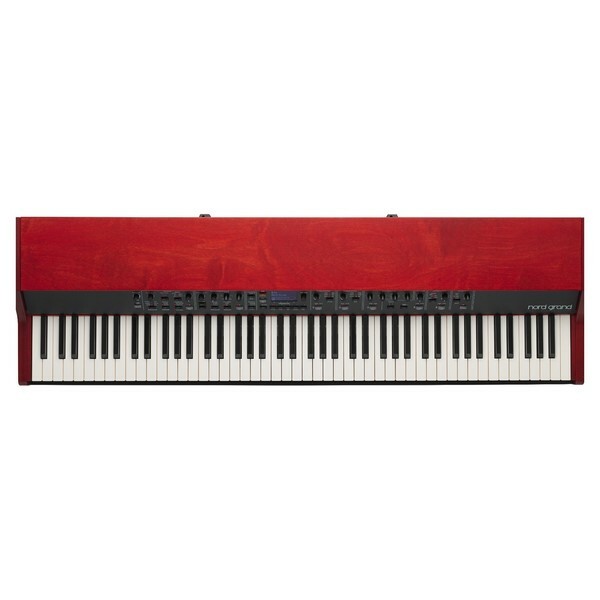 It also features 2GB of memory for the Nord Piano Library. Creative piano filters allow you to change characteristics of your sound, creating a unique tonality. It also provides you with three dynamic curves to choose from, spanning from light to heavy. The comprehensive Nord Sample Library 3.0 is now available for all Nord 3 models and the Nord Grand. The Nord Sample Library 3.0 boasts a wide range of premium-grade sound content, spanning across every genre. The sample library boasts exclusive content from the legendary vintage-tape samplers Mellotron and Chamberlin, giving you access to an array of vintage sounds. The sample library includes everything from pianos, strings and orchestral sounds to vocals, synths and even accordion content. The Nord range boasts a lossless compression algorithm to compresses larger-sized samples into ultra-small file sizes, without compromising audio fidelity. Included with the Nord Grand is the sought-after Nord Triple Pedal. This unique trilogy of pedals allows you to take full control of your playing. It features Soft and Sostenuto pedals, as well as a unique Dynamic Sustain pedal. One of the most unique features of the pedal is the Pedal Noise functionality. This emulates the mechanical sounds of lifting and releasing the damper mechanism, for a truly authentic grand piano experience. 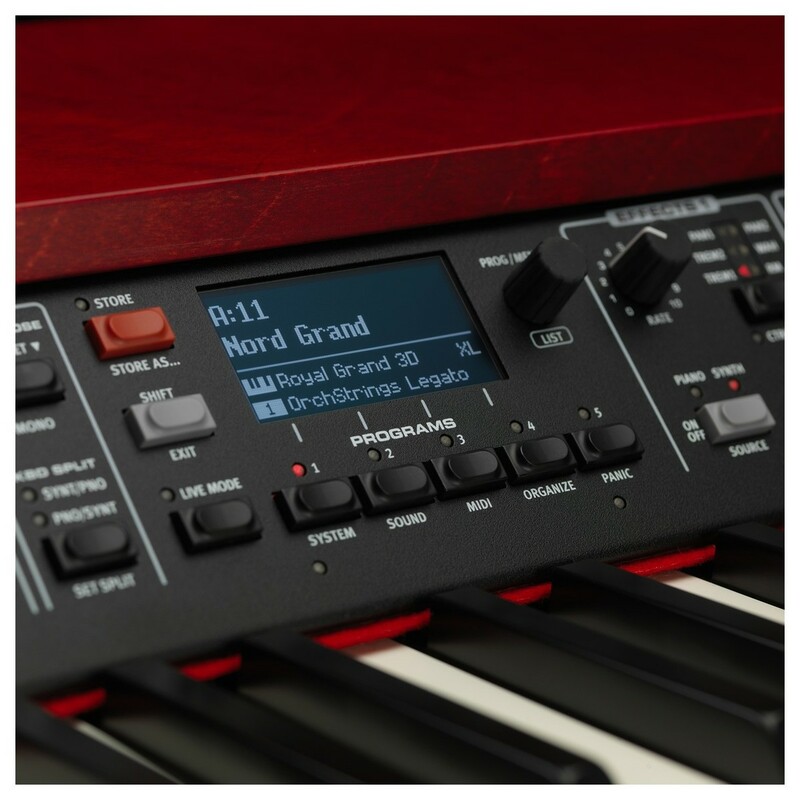 In addition to the sample and piano sections, the Nord Grand also features a wide-range of premium-grade effects. Jam-packed with tweakable high-end stereo effects, the Nord Grand allows you to customise the tone and shape of your sound. The effects are modelled after classic stomp boxes, giving you the warmth and grit associated with analog gear. The effect section includes: Tremolo, Phaser, Chorus, Pan, Wah, RM, Flanger, Vibe, EQ, Delay and Reverb effects. The Reverb effects features a trilogy of settings including Hall, Stage and Room reverbs, as well as an optional Bright Mode. Beautiful looks, beautiful sound. The eye-catching flagship red finish will stand out on any stage. The integrated interface features a bright and crisp OLED screen, allowing you to easily switch between sounds, parameters and effects. The ergonomic layout places the screen in the centre of the stage piano. It features a wide range of controls including knobs and buttons that provide quick and easy navigation. The Grand is also compatible with the Nord Piano Monitor. These optional speakers (not included) can be connected directly to the Nord Grand, using the optional Monitor Brackets (not included). This eliminates the need for external speakers, providing the ultimate nearfield listening experience.